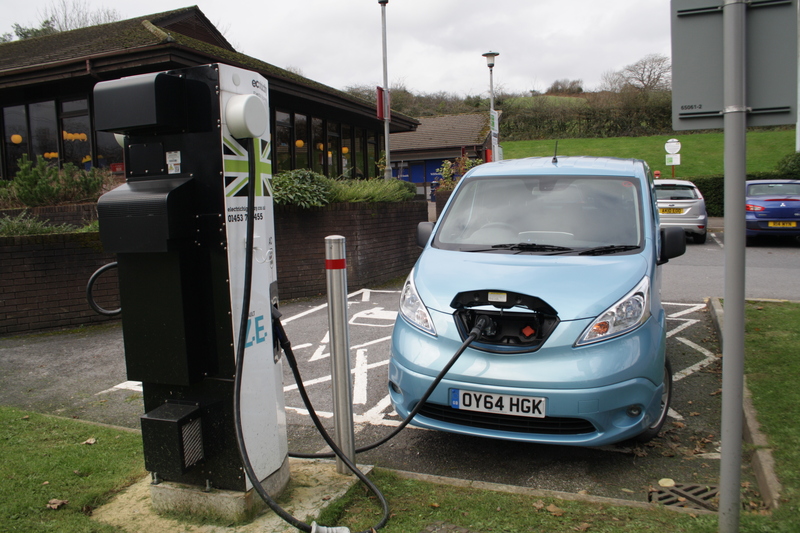 The Electric Roadtrip – Nissan e-NV200 Combi Pt1 – HubNut – celebrating the average! I’ve driven quite a few electric cars, but I’ve never used one for a long journey before. With Nissan’s e-NV200 Combi on my driveway and an impending trip to Devon to see my parents, it seemed only right to ask the question – can you do a long journey in an electric car? First step was to charge the e-NV200 overnight at home. This ensured I had 100% battery charge – important as from my home in rural mid-Wales, the nearest charger was 61 miles away in Llanelli. As my baseline testing had revealed a likely range of 50-60 miles, this was going to be interesting! Second step was to plan the journey, while electricity gently tickled into the e-NV200 at the rate of 3kwh – about the same as an immersion heater. I decided we could make it to Llanelli, but noted contact details for Dinefwr Park near Llandeilo. They have a charger, just in case we were running short. From there, the M4 and M5 have no shortage of chargers, but I listed all the services and postcodes ready to enter into the sat nav. It would be important to know how far away each charger was on the way. Charging took place overnight. I don’t know how long it took, as I was asleep. Ten hours is probably likely if the battery is in a low state of charge. We reckoned that the most a charge would cost us is £4.50. I made the most of being hooked up to the grid by telling the van to run the heater before we set off. You can do this by pressing a button on the fob, or programming it via the screen inside the e-NV200. With the Combi packed and warm, we unplugged, stashed the cable in the back and set off. We live at quite an elevation, which was an advantage. Most of our route to Llanelli was downhill. There was a climb from Lampeter. This began to seriously eat into our range. 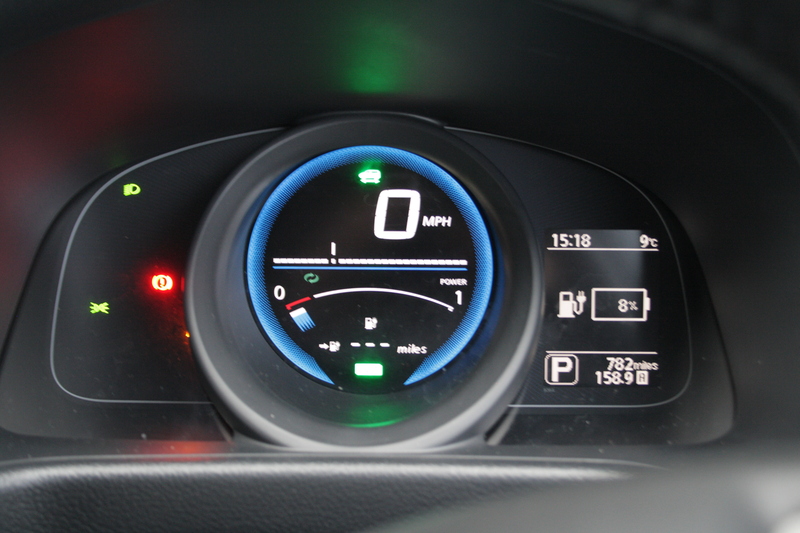 With the heater off, the e-NV200 had been confidently predicting that we had 77 miles of range. That was dropping rapidly. Range anxiety began to kick in and I began to ‘hypermile’ – driving as gently and smoothly as possible, and trying not to use too much power going uphill. Our travelling speed dropped and tension levels rose. There’s a setting to restrict your speed, so I started to use this – setting it to prevent me exceeding 50mph. That’s handy and allows you to focus on the road, knowing you won’t accidentally go too fast, and inadvertently use too much power. Once the road opened up a bit, I switched to cruise control – still at 50mph, even on unrestricted dual carriageway. We reached Llanelli with the battery at 20% and a range of 12-20 miles (former with the heater on, latter without). Not too bad. We fathomed out how the rapid charger worked and connected up. Within a minute of our arrival, a Nissan LEAF turned up and was frustrated to find that despite two parking places, the rapid charger could only charge one car at a time. They were forced to leave. Fighting over power already! In half an hour, the battery charge rose to 86%. We decided this was enough and pushed on. Our first ever rapid-charge. Very easy and no smell! Choosing what speed to do was the next challenge. I decided 70mph was too much. Easily possible, but the blunt aerodynamics of the boxy e-NV200 were going to make that very unecomonical. I opted for 60mph and set the cruise. That was fast enough to keep us out of the way of the 56mph-limited trucks. Even so, some steep hills caused the range to drop rapidly. We thought the range of 80 miles would be sufficient to get the 54 miles to the next charger, but it was looking increasingly iffy. I reduced our road speed and began to get in the way of the trucks. I hoped that giving them a flash to pull back in as they overtook made up for us obstructing their progress. There are services either side of Cardiff. We decided to stop at the first one, which is when I remembered that the charger was showing up as out of service on the Ecotricity charger map. We had a look anyway, and at no point did the charger tell us it wasn’t working. It just didn’t work! We nervously headed back out onto the motorway and were somewhat relieved to make it to the next services. By now, the gauge was refusing to tell us what mileage was left – meaning less than seven – and the battery charge was showing as just 8%. We’d taken to leaving the heating off to stretch the range. By now, it had already taken three hours to get this far – as long as it usually takes to get to my sister’s house near Tiverton. We plugged in and headed off in search of tea. EV fans often flag this up as a huge advantage. ‘Just plug in and go and grab a drink,’ they say. If we did that at every recharge, we’d be spending as much on tea as we normally would on petrol! While we sipped our brew, another Nissan LEAF arrived! It seems these electric cars really are becoming more popular. This chap was happy to wait for us to charge, and told us that he has covered over 30,000 miles in his LEAF in a year. For some people, EVs really do make a lot of sense. He loved the EV life. We charged to 87% and drove on. It had been a quirky adventure at first, but the gloss was rapidly falling off this trip. Nice as it was to have heated seats and a heated steering wheel, we were still cold! We’d put the heater on for a bit – essential to stop it misting up – but would then start worrying about the effect on range, so we’d turn it off and start feeling cold again. Then the Combi would mist up again, so we’d put the heater on for a bit. Then turn it off again. Not fun. However, this trip wasn’t about discovering if electric was better than more traditional fuel. It didn’t take much planning to realise it really wasn’t. Instead, my aim was to see if such a journey was even possible. We arrived in Bideford a lot later that night (after a stop for a meal with family in Tiverton) in an electric car. We had driven over 200 miles in an electric car. Sure, petrol or diesel would have been much swifter, but we’d proved the point that you needn’t leave your EV at home if there’s distance to cover. There wasn’t much of a glow of satisfaction, but it was a start! In part two, we head back to Wales, find ourselves 24 miles from home, with 22 miles of range and increasingly cold toes. Will we make it? !